Syntronik CS is a dream library recreating the sonic signature of the most sought-after classic analog synthesizers and string machines ever created, all deeply multi-sampled and chosen for their unique feel and magical tone, ready to play on your iPhone® or iPad®. 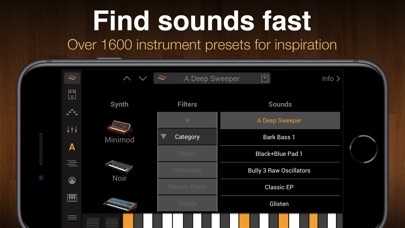 Get started with 7 instrument presets using sounds from 4 different synthesizers. Syntronik CS gives you access to all features immediately, so you can shape and edit these sounds in a range of innovative ways. Create complex rhythms and sequences with a powerful note and chord arpeggiator, each with its own assignable range and settings as well as the ability to store them for instant recall. Forge, mangle and shape sounds thanks to 37 effects ranging from dynamic processors to amps, filters, EQs, modulation, reverbs and more. Each instrument allows for chaining up to 5 different effects, for never-heard-before sound combinations. 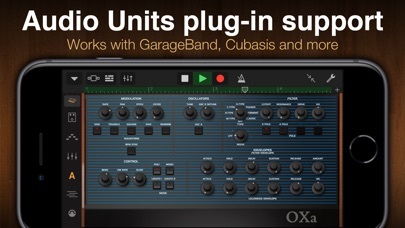 Syntronik fully supports Audio Unit hosts like GarageBand, Cubasis, Auria, and others, allowing you to easily record projects on the go using your favorite synths from the collection. The complete Syntronik library recreates the sound of 44 classic hardware synthesizers and string machines and cover an incredibly wide range of sonic palettes, giving you over 1,600 instrument presets, 200 meticulously programmed Multis* and 129 exciting arpeggios. Thanks to IK’s DRIFT™ technology, which emulates the way real analog circuits behave over time, Syntronik is the most authentic sounding analog virtual synthesizer to date and is the one-stop solution for musicians, producers and synth aficionados demanding utmost sound quality and extreme playability. Our team of developers and sound designers worked relentlessly to capture each machine’s “DNA” for the most realistic and flexible instruments possible. Now you can have these sounds with you on your mobile device to create music and grooves anywhere inspiration strikes. 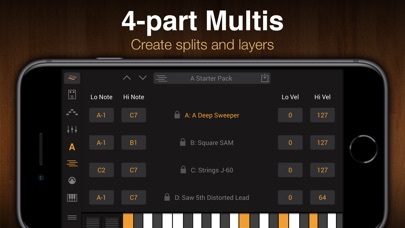 Features: • Includes 7 instrument presets using sounds from 4 virtual synthesizers. • Expandable up to 22 virtual synths providing the iconic sound of 44 machines: (Moog Memorymoog, Micromoog, Model D, Modular Moog, Opus 3, Prodigy, Rogue, Taurus I, Taurus II, Taurus 3, Voyager, Multimoog, and Polymoog; Roland SH-5, SH-2, Juno-60, Jupiter-4, Jupiter-6, Jupiter-8, JX-10, JX-3P, JX-8P, RS-09 Organ/Strings, RS-505 Paraphonic, and TB-303 Bassline; Oberheim OB-X, OB-Xa, and SEM; Sequential Circuits Prophet-5 and Prophet-10; Yamaha CS-01II, CS-80, GX-1 and SY99; Korg Mono/Poly and Polysix; ARP 2600 and String Ensemble; EMS VCS3, Alesis Andromeda, Solina, Elka, Rhapsody 490, Hohner String Performer, PPG Wave 2.3, Realistic Concertmate MG-1) • Dynamic arpeggiators: create complex and compelling rhythmic lines • Multis: combine instruments, define ranges, split points, FX and sequences • 37 astounding effects: (Black 76, White 2A, Model 670, Parametric EQ, Vintage EQ-1A, Channel Strip, Crusher, Overdrive, Overscream, Lo-Fi, Phonograph, AM Modulation, Ensemble Chorus, Chorus C1, Electric Flanger, FM Modulation, Opto Tremolo, Phaser, Rotary Speaker, Small Phazer, Uni-V, AutoPan, Slicer, LFO Filter, Env Filter, Wah, Multi Filter, Digital Reverb, Digital Delay, Spring Reverb, Tape Echo, Stereo Imager, Amp & Cab Echo, Modern Tube Lead, SVT Classic, Jazz Amp 120) • DRIFT™ technology: exact emulation of analog circuit behavior over time • 4 analog-modeled filters: Moog transistor ladder, Roland's IR3109 chip, Curtis CEM3320 chip, Oberheim SEM state variable filter • 1650 presets • 200 Multis* • 129 arpeggios • Inter-App Audio & Audiobus compatible • Single models available separately via in-app purchase • AU plug-in support *Available by purchasing the full version of Syntronik, Syntronik Deluxe (full or upgrade), or all the individual Synths of the collection via IAP. More info: http://www.ikmultimedia.com/products/syntronikios All trademarks are the property of their respective owners and are not associated with IK Multimedia. I haven’t tried the $10 version, but this free synth exists to give you a taste of their various offerings. And even so, the included synths allow you to change many settings and get quite a few sounds for free. If you scroll down the purchases page you will see any number of synths you can buy individually for $10 each. That’s no different than what many others are offering for the same price. And the sound is really good. Thanks for the demo! 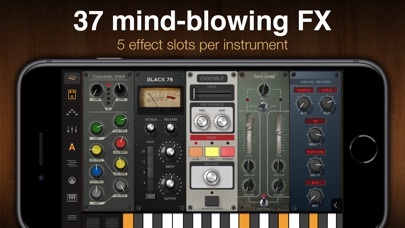 i dont get it ...2 or 3 presets and 4 synths and then 100$ for the full app!!? 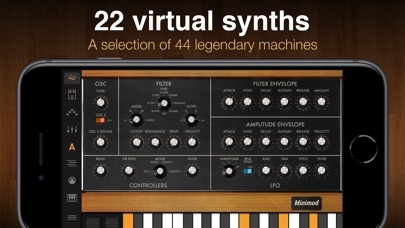 Yikes Why bother ?the description clearly says 44 synths where are they?